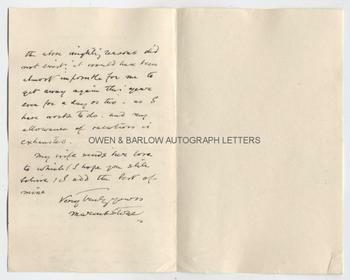 MARCUS STONE autograph letter Signed. ALS. 2pp plus integral blank leaf. 8 Melbury Road, Kemsington Road, W. September 26th 1895. To [William] Woodall. Together with a fine contemporary portrait photograph. 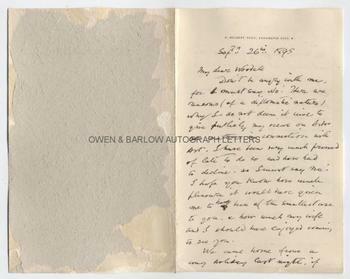 "Don't be angry with me, for I must say 'No'. There are reasons (of a diplomatic nature) why I do not deem it wise to give publicly my views on Art or matters in connection with Art. I have been very much pressed of late to do so and have had to decline, so I must say 'no'. I hope you know how much pleasure it would have given me to have been of the smallest use to you and how much my wife and I should have enjoyed coming to see you. We came home from a very long holiday last night, if the above weighty reasons did not exist, it would have been almost impossible for me to get away again this year even for a day or two, as I have work to do and my allowance of recreation is exhausted. My wife sends her love to which, I hope you will still believe, I add the best of mine." 8vo. Approx 7 x 4.5 inches. Mounting residue and slight damage to verso of the integral blank leaf but the text leaf is fine. 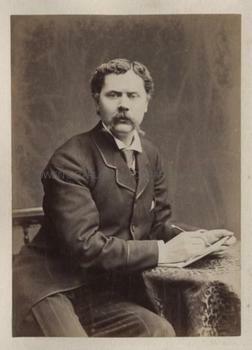 The portrait of Marcus Stone is a contemporary albumen silver print photograph, showing him half-length, seated, with paper and pencil in hand. It measures approx 5.75 x 4 inches (excluding mount) and is laid down on card from an album leaf. Mounting damage to verso but the photograph is in fine condition. Marcus Stone began his career chiefly as an illustrator. He illustrated works by Charles Dickens, Anthony Trollope and others. He then achieved success as a painter of historical scenes before finally finding his niche as a painter of sentimental subjects which were executed with much charm and refinement. He began exhibiting at the Royal Academy when still short of his 18th birthday and was elected an associate member in 1877 and a full Academician in 1887. 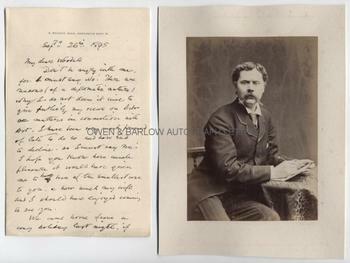 Marcus Stone was a close friend of fellow painter Luke Fildes and the two were near neighbours in Melbury Road. William Woodall, the radical Liberal M.P. for Hanley and Stoke on Trent, was also a trustee of the Wedgewood Institute in Burslem and it is most likely that the speaking engagement here declined by Marcus Stone, was an invitation to address the students at Burslem.